In 2012 -- the latest year for which data is available -- it was just 16%. The United Kingdom has seen the biggest growth in its share, trailing closely behind the U.S. with 12.6%. This is good news for British universities, as foreign students pay up to three times more in tuition than students from Britain and the EU. South Korea has also increased its share dramatically, from less then 0.2% in 2000 to 1.3% in 2012. More than 4.5 million students enrolled outside their own country in 2012, with three-quarters of them studying in developed countries. Over half came from Asia, with China now representing 22% of all international students, followed by India and Korea. 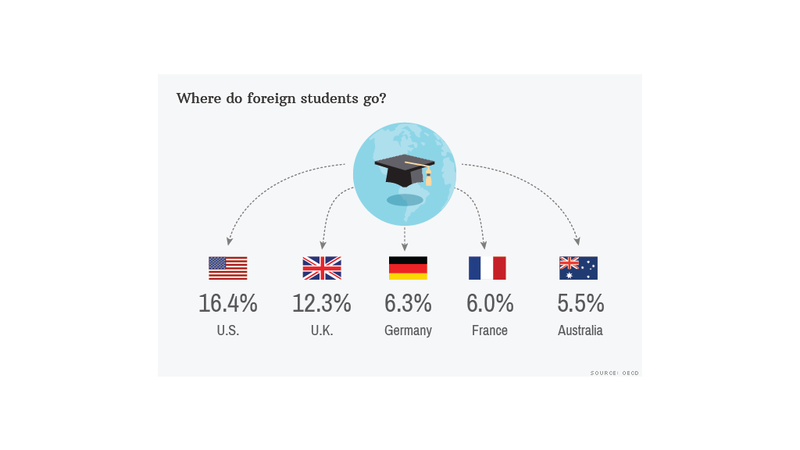 The OECD praises countries that welcome international students, saying they boost local economies, since they speak the language and employers understand their qualifications.